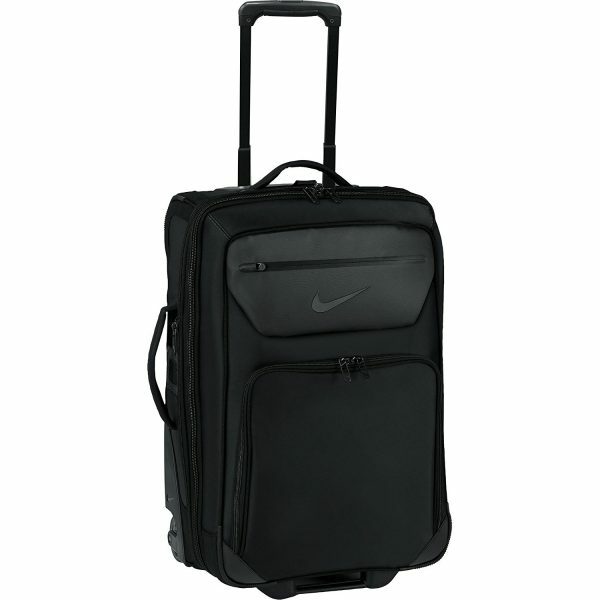 Black Nike Departure III is a single carry-on size, solid and sturdy luggage bag that is made of sturdy twil polyester (75%), polyurethane (23%) and aluminum (2%). Just at the front exterior it includes a fleece-lined pocket for your valuable things, and it is resistant to water, so you can have a peace of mind in the rain. It has a solid telescoping handle that can be adjusted for height and locked conveniently. You will find two other handles, and you can hold the bag vertically and horizontally, whichever suits you better. It has quite a spacious interior and the zipper is lockable for keeping your things safe. And the internal compartments with zipper will help you keep your clothes and other stuff better organised. This is a small 20-inch carry-on size bag that is suitable for use as a cabin suitcase to take your valuable stuff with you on the plane. It is a cabin bag in terms of size but you may want to watch the weight restrictions of the airline you’re flying with. It will comfortably fit in the overhead luggage compartment on the plane as this is designed to be used as a cabin luggage. And you should not have any difficulty even if you were to fill it up completely and expand it. It measures 14 x 22 9 inches and please note that the depth can be expanded from 9 inches to 11 inches, so it expands quite a bit. With the expanding feature you can store more of your stuff as it gives you more storage space. It looks exactly like it is in photos and has the exact features advertised on the product review page. With the mesh in the internal compartment that acts as a divider, you can separate your accessories comfortably. The main compartment is divided into three sections, one on one side and two on the other side. And all of this is divided by the solid and heavy duty zipper. The smallest section is one third of one side (and is accessible from the outside as well), larger one is two thirds and the largest part takes up the full height on the other side. They all have the mesh covers and they will kept safely in place. You can put your jacket into the large external pocket. It is very easy to move this cabin luggage through the terminals as it comes with the inline skate wheels and a solid and convenient telescoping handle. Very short or very tall people can roll it comfortably, without any difficulties. This is not a cheap- low priced suitcase by any means and that is pretty much the only negative we can point out. But for those that are happy to pay for the best quality with great features, this is definitely worth considering. If you are a frequent business traveler, this brand new release Departure III by Nike will become a great part of your life.